Have you ever had zucchini pasta? It’s really good, especially with a delicious lentil bolognese sauce. This Vegan Zucchini Pasta Lentil Bolognese is incredible. Not only is it vegan and easy to make, it’s also gluten free. 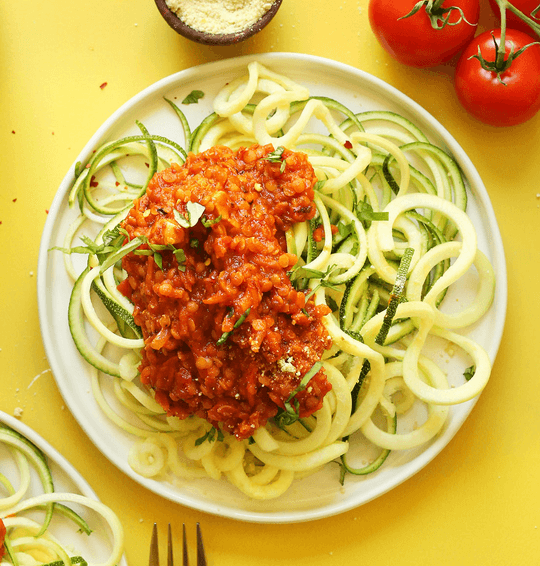 Did you buy a spiralizer because you saw it on TV and thought it would be amazing. But now it’s just sitting in the cabinet collecting dust and you have forgotten about it. Am I right? Well get that thing out and let’s make some incredible veggie pasta. This is a dish you make you real happy you bought that thing. Zucchini pasta is vegan of course. It’s also very healthy, light and delicious, and gluten free. I’ll be honest and tell you it doesn’t taste like pasta. It’s not supposed to. We just call it pasta because it serves the same role as pasta in a dish with a delicious red sauce. So let’s talk about this red sauce. It’s a rich hearty marina that contains carrots and lentil. You will be getting a lot of vitamins as well as protein with one serving of this sauce. With it served over the zucchini pasta you will have a delicious, high fiber, high protein, vegan and gluten free meal you will love eating. Are you ready to get this recipe and enjoy. This easy vegan pasta recipe is courtesy of Minimalist Baker who also make these mouth watering photos. 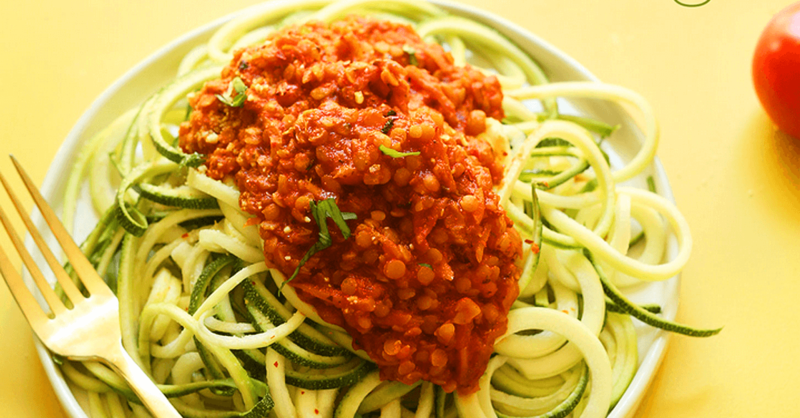 You can get the recipe for Vegan Zucchini Pasta Lentil Bolognese by clicking here.